Oh no! A pesky skunk sprayed your dog. Now what? Don’t go into a frenzy quite yet. 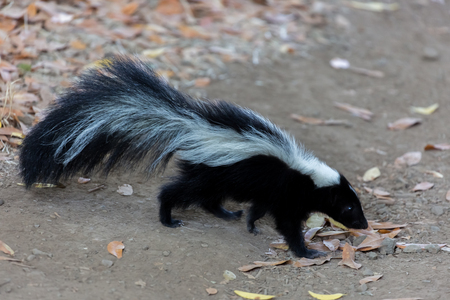 We have some tips that will help you get rid of that smelly skunk stench! Your dog might be disoriented, so try to be relaxed and put your dog outside in a crate. The less things he comes in contact with, the fewer things you’ll have to de-skunk later. Once your dog is confined, try to gather the supplies and work as quickly as you can since skunk smell settles fast. Next, grab one quart of three percent hydrogen peroxide, a quarter cup of baking soda and one teaspoon of liquid dishwashing soap. Put on rubber gloves and wash your dog as soon as you can. Rub the ingredients on your dog’s coat, avoiding the area around his eyes and allow it to set for 20 minutes before washing your dog. After the mixture is washed out, wash your dog with dog shampoo and be sure to rinse him well! Still stinky? Repeat the process a few more times until the scent is gone. Getting rid of skunk smell on your dog is no easy feat. Try to avoid it all together by walking your dog during the daytime or in well-lit places. If you happen to smell skunk, be sure to call your dog inside and keep your dog’s run away from any wood piles or other areas skunks like to make dens in! Looking for beneficial dog information? Be sure to check out our blog often! Who love providing useful knowledge to you! To learn more about the puppies we have for sale, click here and contact us with any questions you have!